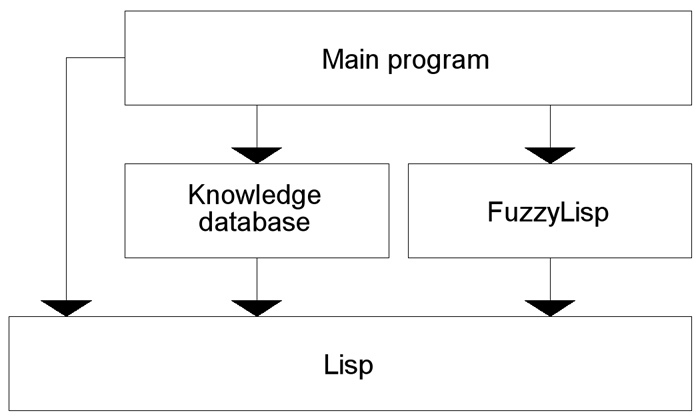 FuzzyLisp is, simply put, a collection of Lisp functions that allows you to explore the world of Fuzzy Logic theories and develop Fuzzy Logic applications with relative little effort. You can think of it as a small and compact metalanguage that permits you to concentrate in the construction of fuzzy models while still retaining full control of all the Lisp features. The figure above expresses the overall phylosophy of FuzzyLisp. You build a knowledge database by means of suitable linguistic variables and fuzzy expert rules. Then, for building your fuzzy model you only need to make function calls to FuzzyLisp while mantaining full control of the Lisp language. This page is the companion website to the author's book titled "A Practical Introduction to Fuzzy Logic using Lisp". From the sections below you can have a preview of the book, buy it, download all the code from the book and get the complete on-line reference for every function in FuzzyLisp. It is also a direct interface to the author. Please, don't hesitate to send him your comments, suggestions, etc.